Cullman, AL - October 22, 2013 - TSE Brakes, a Marmon Highway Technologies®/Berkshire Hathaway Company, announces their innovative Severe Duty design is now available on UltraLife and Omnibrake spring brakes, offering increased durability for heavy-duty applications with the industry's longest service life. TSE's unique Severe Duty design protects the piston rod with an accordion style boot cover made from neoprene-impregnated rubber, which allows fewer outside contaminants for increased durability and longer life. Severe Duty spring brakes also feature a stainless steel clevis pin to help prevent seizing at connection between chamber and slack adjuster and an increased resistance to chemicals. Additionally, all breather holes are plugged except for two holes per tandem, allowing the chamber to drain and breathe while protecting the chamber from outside material, ultimately extending service life of the brake. Severe Duty Brake Chambers | TSE BrakesSevere Duty spring brakes are available in both the UltraLife and OmniBrake models and feature their exclusive design for the industry's longest service life. Available in a 2430 and 3030 size in 2.5" or 3" stroke, TSE Severe Duty spring brakes are an OEM quality replacement. As the only chamber manufacturer that offers all steel construction, TSE's in-house full immersion e-coating also guarantees 100% coating and consistent mil thickness for the best corrosion protection. Through their in-house lab, TSE conducts extensive testing on brakes including tests such as variable pressure cycle, vibration, cold cell cycle, salt spray and slurry tank - exposing chambers to 2 million cycles, double SAE standards. TSE Brakes' Severe Duty design is ideal for brakes that start and stop constantly, as well as salt-water port applications or other applications where the vehicle may be exposed to corrosive chemicals such as concrete, citric acid, muriatic acid, magnesium chloride and calcium chloride. Applications include refuse, concrete, school buses, and off-road vehicles such as dump trucks. 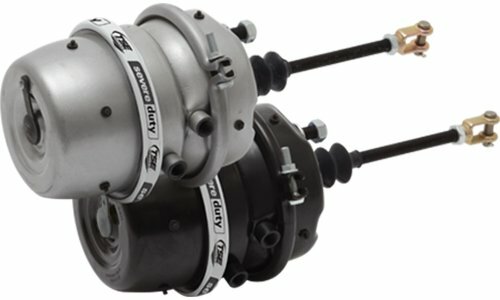 Severe Duty chambers come with an UltraLife 3-year or OmniBrake 2-year warranty. TSE Brakes' premium quality spring brake, UltraLife is the ultimate brake for performance and durability and features an innovative and patented design. UltraLife brakes receive a pretreating and undergo an e-coating process to provide the industry's best corrosion protection and deliver the industry's longest service life. The OmniBrake features TSE's patented design, is completely sealed and tamper-resistant with a unique precision weld. OmniBrake has an all-steel housing and center section, a welded spring housing and center sealed assembly, and a main spring made from chrome silicon pre-tempered wire and specially coated to provide premium life and durability characteristics.